I was sent two products by KKCenterHK for review purposes. They’ve also given me a coupon code to share with my readers, simply enter the code polisharmoire and receive 10% off until the end of January, 2014! 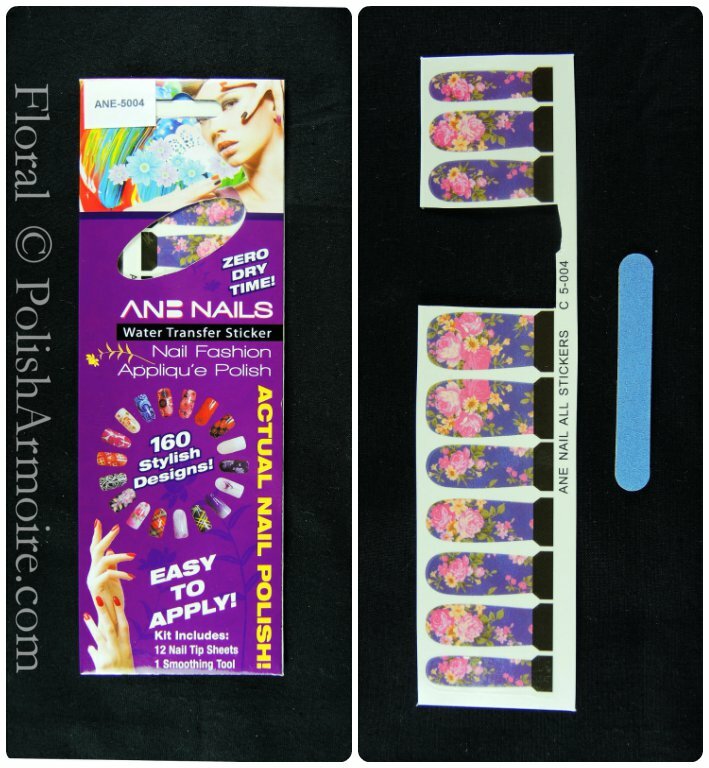 The products sent were a pack of ANE-NAIL 12 Pc Floral Transfer Sticker & Files #5004 (item # ANE-5004) and a gorgeous N.NAIL 15 Piece Synthetic Fiber Art Design Brush Set With Case (item #JR1129). 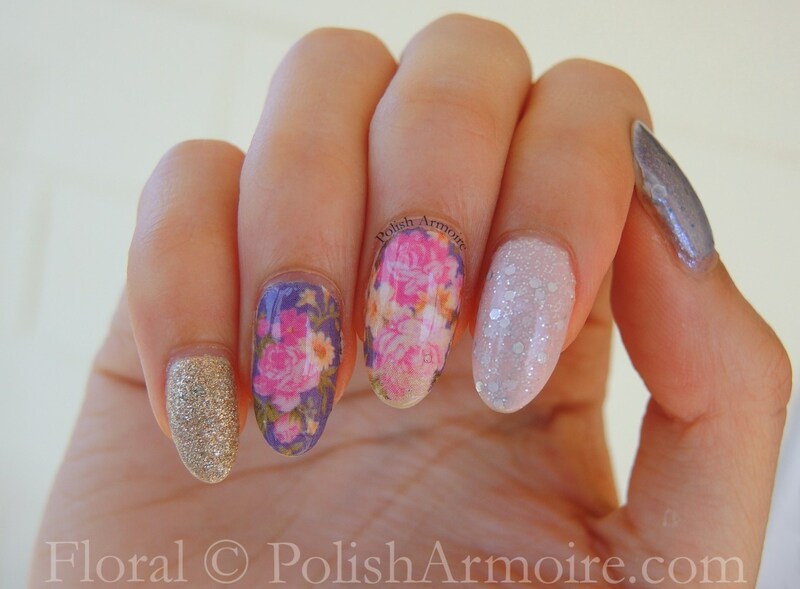 I’ll be reviewing the floral water decals today which I hastely applied just before I jetted off to Australia. This photo was taken in Australia around 2 days after I put them on hence I don’t have my usual black background – do like the white or black background better for manis? The water decals held up quite well and I got my first chip at the 5 day mark. The water decals were also a relatively quick way to spruce up my mani without having to spend a lot of time creating intricate nail art! I have three coats of Zoya Pixie Dust Tomoko, a gold texture polish on my pinky and three coats of Revlon Popular, a pink crelly with silver glitter on my index finger. The pack of decals comes with 12 nails worth of designs where 6 of them mirror the other 6. They are long enough that you would be able to use one decal on two nails if you have short nails. These decals are also fully opaque so no base polish colour is required. I followed the same steps as stated in the water decal tutorial here to apply them with the only difference being I had to make sure that I trimmed the cuticle end of the decal well. This was because one of the nail decals had printing that was a tiny bit offset. I also had to carefully file off the excess on the tip of the nail using the file included in the pack of decals. These decals can be stretched to fit your nail during the drying process if they end up being a bit too narrow for your nails. If you are like me and use the decals in skittlette manis, one 12pc pack of decals should last you for quite a few manis! Tags: Crelly, Pixie Dust, Textured Polish. Bookmark the permalink.